Facebook will add a notification function Safety Check to the mobile app which enables users to let family and friends know they’re safe in case of a disaster or crisis. 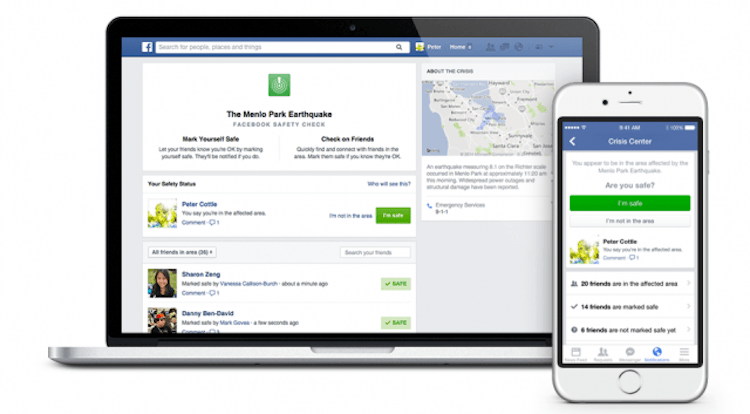 During crises or disaster communication is critical, Facebook realized over the years. The social network saw people turning to Facebook to check on loved ones and to get updates. “We wanted to provide a helpful tool that people can use hen major disaster strikes”, says VP of Product Management at Facebook Naomi Gleit. The company follows what happened during and after the Japan earthquake and tsunami in 2011 that killed almost 25.000 people and left hundreds of thousands people homeless. During that disaster, Facebook saw how people used technology and social media to contact their loved ones. Is it 'a rip off'? Some critics already say Facebook’s Safety Check is ‘a rip off’ and the company stole the idea from the Red Cross, which published a similar project called ‘Emergency Check In’ a year ago. Emergency Check In turns mobile phones into a so-called smoke signal to let other people know they are OK and safe. The alert and notification app nevertheless proves the importance of communications in crises and disaster. The question is how well mobile data networks will hold during earthquakes, floodings and hurricanes. Red Cross' app already states mobile networks are likely to malfunction in case of events like these. With the Facebook app relying completely on mobile data, it might be unusefull for its dedicated services, causing even more confusion then there already is.